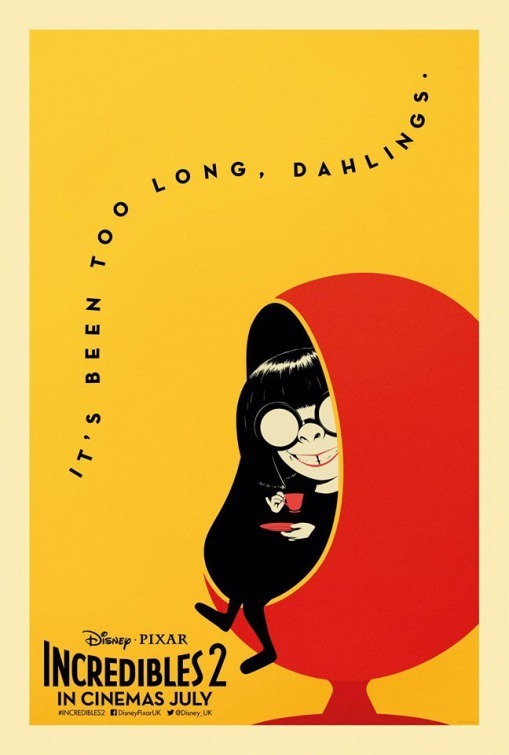 Before The Incredibles 2 begins, a short documentary plays, with the cast and crew of the film explaining and apologizing for the 14 year gap between 2004’s The Incredibles and the new sequel. The Incredibles 2 is host not only to the return of Pixar’s beloved superhero family, but also to the return of director Brad Bird to animation, a medium he has not trafficked since 2007’s Ratatouille. It’s been a long time, the documentary, and indeed much of the narrative surrounding the film, keeps reminding us, but the wait, they assure us, has been worth it. Luckily, The Incredibles 2 lives up to the overwhelming hype, proving its worth as one of the better Pixar sequels and an immensely enjoyable romp in its own right, but it can’t quite undo its 14 year gestation. The film picks up right where The Incredibles left off, with the Parr family (led by the voice talents of Craig T. Nelson and Holly Hunter) facing off with the Underminer, leading to a great deal of property damage and a reinforcement of the looming superhero ban. Fortunately for the broke, relocated family, Elastigirl soon happens upon an opportunity to legitimize “supers”, spearheaded by the eccentric Winston and Evelyn Deavor (Bob Odenkirk and Catherine Keener), which leaves Mr. Incredible to struggle with his greatest challenge: raising his kids. As an inversion of the plot machinations of the original film, with Elastigirl now taking the action spotlight and leaving Mr. Incredible at home, Incredibles 2 once again mines humor and pathos from the heightened difficulty of superhero parenting, while allowing its best character a more active role than she got in the first film. It’s in these first two-thirds of the movie, which begins with a gorgeously rendered action scene and transitions into the incredibly sweet arc of the Parr patriarch as he works to be a more committed parent, that 2’s familial dynamics shine through and elevate it above run-of-the-mill superhero fare. With Elastigirl at the forefront of the film’s action, it’s a shame her storyline isn’t nearly as thematically rich as the Mr. Incredible material. Although bolstered by a fantastic action set-piece woefully early in the film, much of Elastigirl’s story is bogged down by uninteresting villains, a fairly obvious twist, and a frustrating lack of real character growth. The Incredibles 2 suffers most from its super-sized ambition, and the Elastigirl subplot is where the film initially loses focus, culminating in a climax that is not nearly as full as it should be. As the two-hour runtime grinds on, it becomes more and more clear that Bird and crew wanted to include just about every possible story idea they had in the last 14 years into one film. If there’s one facet upon which 2 greatly improves on The Incredibles, it’s in the animation. While continuing the retro, stylized sharp angles of the original film, 2 shines in the details- a natural product of 14 years of improving CGI animation. Everything from the sharp colors, light, and scale are all awesome to witness, lending a necessarily grandiose scope to the thrilling action scenes. Elastigirl’s motorcycle is particularly cool, from its design to its utility, breaking off in to two parts to accommodate her flexibility as she chases down a runaway monorail. The level of detail is breathtaking, and a far cry from the less intentional filmmaking of the MCU and the DCEU. Bird has always had an eye for scale; everything from The Iron Giant to Mission: Impossible-Ghost Protocol have been mindful of making the big moments pop, and 2 is no exception. Although flawed, The Incredibles 2 is a fun, breezy summer blockbuster with a lot more heart than the average superhero film. Fans of the first film will find everything they’re looking for in Pixar’s latest, from the family dynamics of the Parrs, to the excellently designed action set-pieces, and to beloved characters like Frozone (Samuel L. Jackson, thankfully given a whole lot more to do this time around) and Edna Mode (Brad Bird). The Incredibles 2 can’t quite make up for lost time, but it was definitely was worth the wait.